Well, well, well. Wouldja look at that? It's the last week of baking before Christmas, everybody! I really hope you've got some grand plans for this most sacred of times. I personally would love nothing more than to set Little C in front of Frosty the Snowman with an arsenal of snacks, sprint to the kitchen, tie my apron strings and hunker down with a hot oven and absurd amounts of butter and sugar. If you feel me here, then perhaps one of the following might make into your holiday cookie tins this year or onto your last-minute gifting list. Like the sweet little Candy Cane Pinwheels you see up there. They're like sugar cookies with jazz hands, and the recipe for them is at the end of this post. Enjoy! Chocolate Mint Squares. Fudgy brownie, minty buttercream, slick of bittersweet ganache. Is there anything more perfect for the holidays? Don't answer that if you disagree. It's like telling me there's no Santa, all over again. Heirloom Sugar Cookies. My love for this cookie runs deep. Real deep. 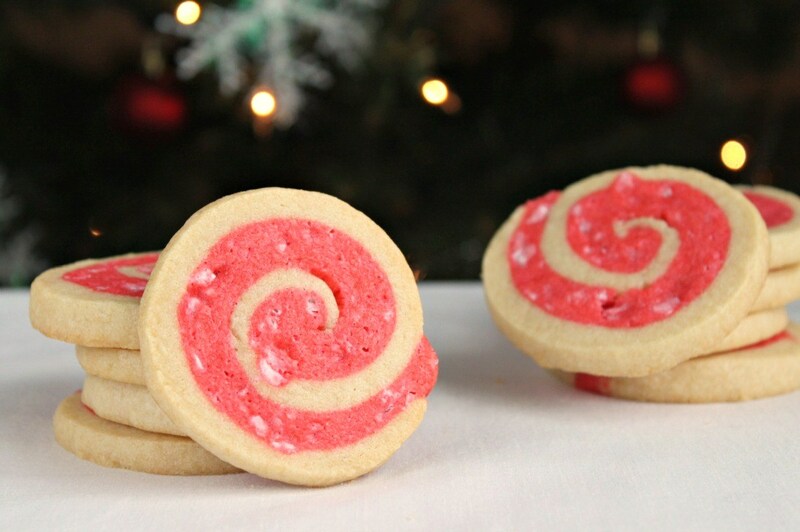 Simple Rolled, Iced Sugar Cookies. It's what holiday baking projects are all about. Classic Gingerbread Cookies. And because they're so flippin' cute, holiday baking projects are all about these, too. The best I've ever tried, icing recipe included. Chocolate-Dipped Peppermint Meringues. Too pretty to eat. So you end up eating a lot, because of the guilt. Chocolate Chip Cookie Brittle. One of the most searched for recipes in Piece of Cake history. Part candy, part cookie, all set up for you to eat the whole dang pan. Salted Peanut Cookie Brittle. 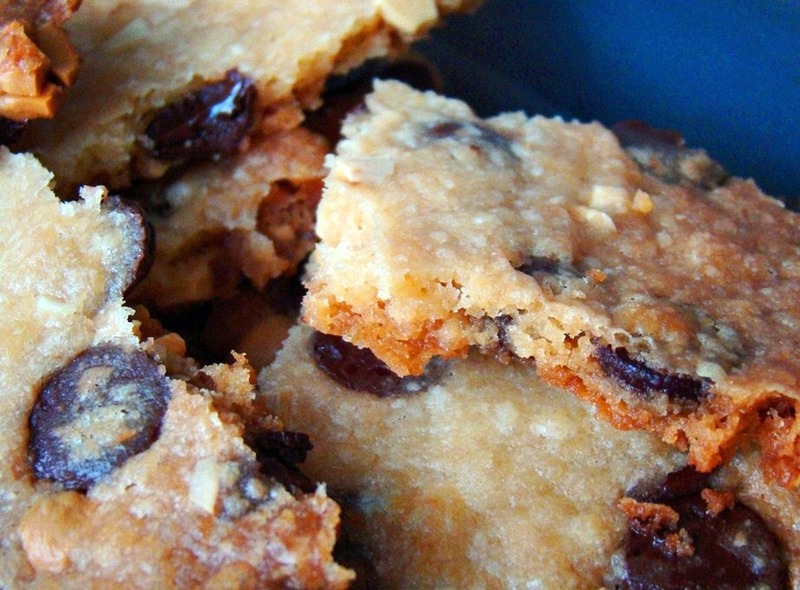 The little sister to Chocolate Chip Cookie Brittle, with an extra salty-sweet, nutty kick. Crispy, crunchy perfection. Aunt Phyllis's Crusty Butter Pound Cake. Perfect for doubling or tripling, this cake is the crowd pleaser you can wrap with a big bow and give to just about anyone who's done something nice for you this year. Chocolate Chip Marble Bundt Cake. Save this one for the actual special people on your list. This cake is nothing short of Stupid Delicious. Chocolate Tweed Angel Food Cake. Something a little lighter, but still full of flavor, and a pillow-soft texture. Perfect for gifting. Cranberry-Pistachio Torrone. Because we all secretly wish we could be Giada for Christmas. Gifting Toffee. 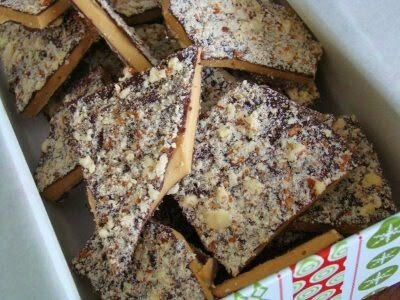 This is the toffee people go crazy for, the one I ship to family across the country. 110% Piece of Cake kitchen approved. Layered Peppermint Crunch Bark. The holiday classic, but crunchier and creamier with a double layer of white chocolate. God Bless Us, Every One. Take the extra time to really get the two dough sheets as identical in size and shape as possible (a ruler helps! ), and don't slice the cookies until the dough is very firm--it's the key to getting a really nice looking swirl on these cookies. In the bowl of an electric mixer, beat together the butter and sugar on medium speed until light and fluffy, about 2 minutes. Beat in the egg and until well-blended. Scrape down the bowl, and stir in the flour mixture on low speed. Remove half the vanilla dough from the bowl and set aside. To the remaining dough, stir in the peppermint extract, peppermint candies and red food coloring on low speed until the dough the color is well-incorporated and the color is the intensity you're looking for. Roll the vanilla dough between two large sheets of parchment paper to create a 14x8-inch rectangle. Leave the dough sheet in the parchment and place on a sheet pan. Repeat with the peppermint dough and stack on top of the vanilla dough sheet. Chill both together until the dough is firmer but still pliable, about 30 minutes. Remove the parchment paper from the vanilla dough sheet and place on a work surface. Repeat with the peppermint dough and place on top. With the long side facing you, roll the dough into an even, tight log. Wrap tightly in plastic wrap and chill until very firm, at least 2 hours. When you're ready to bake, position oven racks to the upper and lower thirds of the oven and preheat it to 375 degrees. Line two baking sheets with parchment or silicone baking mats. Slice the log of dough into 1/4-inch thick rounds and place on the prepared baking sheets, a dozen to a sheet. Bake until the edges are lightly golden, about 12-14 minutes. Let cool on the baking sheets for a minute before transferring to wire racks to cool completely.